Summer can be a difficult time for parents of young children. With the heat, playing outside isn’t always possible, and with summer vacation, the pools are bound to be too crowded to warrant a trip to cool down. What you need is a way for your child to have fun and cool down in your back yard; what you need is a water or sand table for your kid. Why use a Sand and Water Table? 2 divers, 2 squirting friends, 2 scoop cups, plastic "net"
Water and sand tables incorporate the fun of water and/or sand play with an activity table. There are often toys included like scoop cups, buckets, and shovels as well as themed toys like fish or pirates. Even though water and sand tables are still pretty bulky, they eliminate the need for a huge pool or sandbox in your back yard. They can be moved around fairly easily (when they’re empty) so you can find just the right shady spot to set it up. These tables also help to promote imagination and learning through interactive play and watching the effects of physics on the elements. Most of the time, water tables and sand tables are separate items, but occasionally you can find a table that incorporates both if that is what you want. There are some common features you will find with water and sand tables. These may include mazes and spinners, whirlpool effects, and dumping buckets. Oftentimes, you will also find tables that are centered on a specific theme, such as fishing, pirates, or pond life. These will usually include theme-specific features in addition to the ones previously mentioned. Learning starts at a young age, whether you and your child realize it is happening. By utilizing the built-in features, your child can learn about cause and effect as well as physics, such as gravity and water power. By using your own creativity and imagination, you can help to incorporate new activities that promote imagination, creativity, and discovery in your own child. 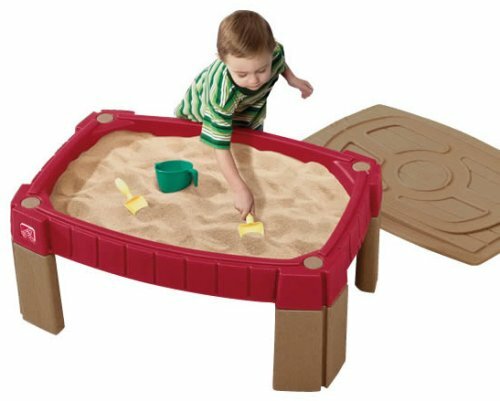 Try taking their sand table and burying some items, giving them a sifter and sending them on a treasure hunt. In addition to the built-in features, water and sand tables often come with some toys to play with. These may include buckets and shovels, sand rakes, balls, squirt toys, and scooping cups. This water table often makes the top of the list in its category. Its design is simple, but it provides plenty of fun for kids around two to six years old. The table comes with 5 character balls that double as squirt toys. They are the basis for most of the activities, including a spiral chute in the center and a Ferris wheel that scoops and drops the balls. You do need to be wary of these toys, though. Just as with any other squirt toy, it is difficult to get all the water out, allowing mold to grow inside. This can cause your child to become ill if they continue to play with them. It also comes with a scoop cup that can be used to pour water through the funnel feature and watch it run over two spinning wheels. You can also keep the water moving by using the spinner to power the lazy river effect. Probably the biggest design flaw is with the drain plug. If it isn’t installed and sealed just right, it will allow the water to slowly leak out. This table is designed for sand play, though some have used it for water even though there is no plug to drain it. The set includes 2 shovels, 2 claw rakes, and a bucket as well as a tie-down lid, which is intended to keep the sand dry and protected from the elements. Unfortunately, the lid doesn’t provide fool-proof protection; it is known to leak into the sand even when tied down properly. There are tracks and grooves etched into the table lid that allow it to double as an extra play space for toy cars and whatnot. Since there aren’t many activities and the table is intended for sand play only, it may be more suitable for older toddlers and children, starting at 24 months and older. 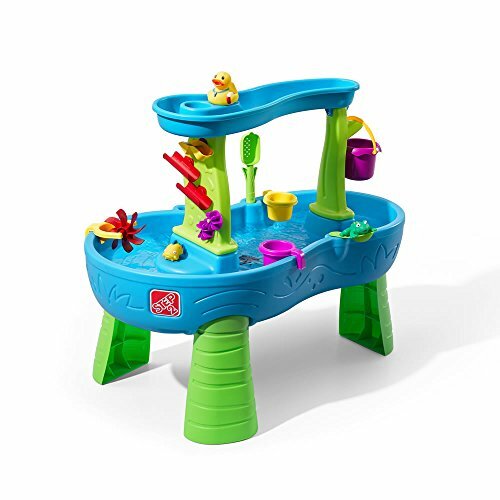 There is no end to the fun with this pirate ship water table. There are several toys and activities that are sure to keep your little one busy for hours on end. 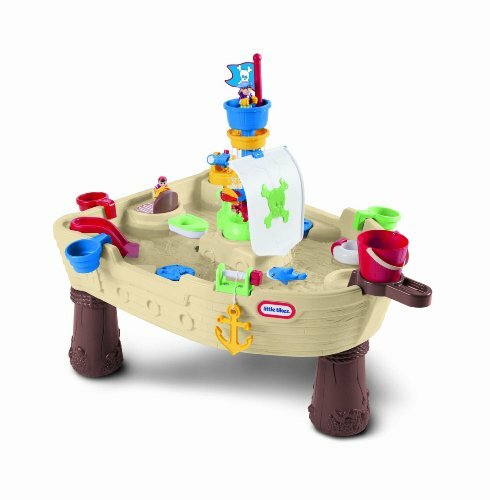 The set includes multiple pirate-themed features including a crow’s nest water maze, water shooting cannon, and an anchor that lowers with a crank. There are also several toys included – pirates, a shark, a boat, and a life ring. This table is one of the biggest on our list, which makes it a bit harder to store for the colder months. Water is also known to leak into the base of the table (the ship part) making it very heavy and difficult to drain when you are done with it. 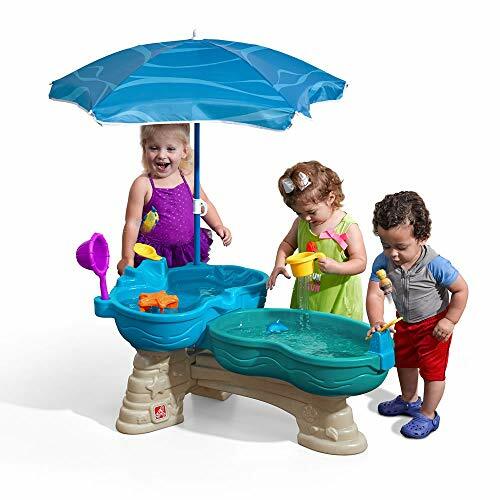 This water table offers fun and play on multiple levels, literally. The set includes two scoop cups, a bucket, 3 animal friends, and multiple water maze pieces. When water is poured into the top section, your child can watch and listen as it transforms into realistic rainfall. You can also help them set up and rearrange the water maze in multiple ways, helping them to observe and discover cause and effect. You do need to have some patience (and possibly a power drill) to assemble this water table. Many have said that it is very difficult, especially since there are no pre-drilled holes for the screws. It is also said that the table is known to leak through the newly drilled holes as well. Unlike the other water tables we’ve looked at, this one is a bit more simple. Some may even say there isn’t much for a child to interact with. However, we felt that there were still enough great features to include it on our list. There are two levels to this table, which makes it great for your child to play with from a young age (18 months or so). Included with the set are 2 divers, a fish and a dolphin, 2 scoop cups, and a plastic “net” for scooping toys out of the water. One of the best features about this table is the attached sun shade umbrella. You can rest assured knowing that your child is safe and shaded. While there aren’t a lot of activities, there is a spinner to create a whirlpool effect in the water, adding movement and fun. 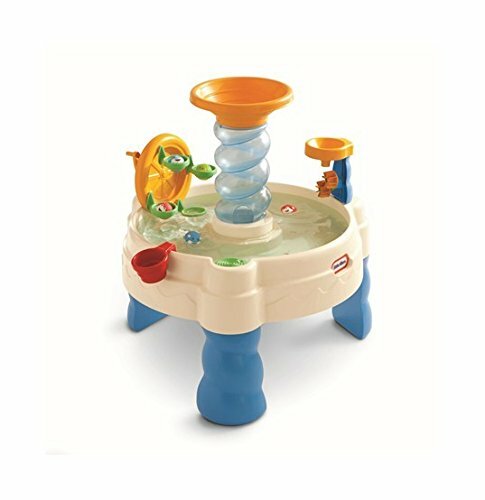 There is loads of fun to be had with this water table, which is the perfect combination of all things water and fish. 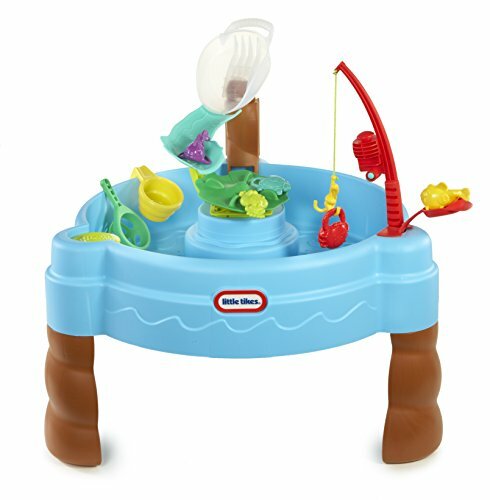 Included are 5 fish friends, a net, scoop cup, and fishing pole as well as built-in activities to interact with. Your child can have fun dumping their fish from the water bowl on top and watching them float down the water slide onto the spinning lily pad. They can fling their fishy friends into the water from the catapult on the side, and they can even try their hand at catching their little friends with the fishing pole. Even though this table is intended for water, it is also able to hold up to 50 pounds of sand if you wish to switch it up every once in a while. There are a couple of minor frustrations with this table, however. Some have said that the construction is lacking, with assembly holes being drilled in the wrong places in particular. It is also known to leak slightly from the plug. A water and/or sand table can be a great way for your child to have fun and cool down in the summertime without needing to travel to a crowded pool or beach. They also take up less space in your yard than a kiddie pool or sandbox. Not only are they fun, but they also promote learning and discovery through the observation of cause and effect as well as imaginative play with characters and toys. What do you think? Do you have a recommendation for a water or sand table? Let us know!